In an uncertain market obtaining accurate market values on housing assets can be increasingly difficult. Many organisations are turning to data to provide more informed decision making. Leveraging data is imperative and the trick is to make this data available to large and small surveying firms and lenders alike. In our context of providing property risk management software to surveyors using mobile devices (iPad) to collate site notes and produce intelligently mapped mortgage valuation reports, or our business platform (Survey Hub) to efficiently manage the end-to-end valuation process, it is ultimately about enhancing the decision making process around the property being bought, remortgaged, revalued or repossessed. Better use of better data is a game changer and is not the preserve of larger organisations alone. Initial appearances are that the tools and personnel specialising in this area of data analytics are costly. However, this is far from the case as access to and benefits derived from these tools and outcomes is much easier. What we are seeing is a growing importance of property underwriting which reinforces value and sustainability of a property linked to a particular borrower but could also influence factors such as product and property valuation pricing. Users of this technological approach to improve decision making will also see PI premium reductions and significant operational efficiencies. 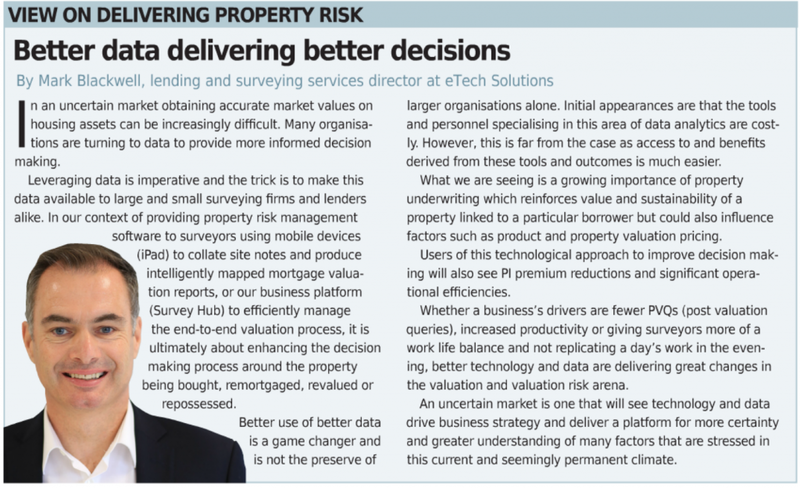 Whether a business’s drivers are fewer PVQs (post valuation queries) increased productivity or giving surveyors more of a work life balance and not replicating a day’s work in the evening, better technology and data are delivering great changes in the valuation and valuation risk arena. An uncertain market is one that will see technology and data drive business strategy and deliver a platform for more certainty and greater understanding of many factors that are stressed in this current and seemingly permanent climate.